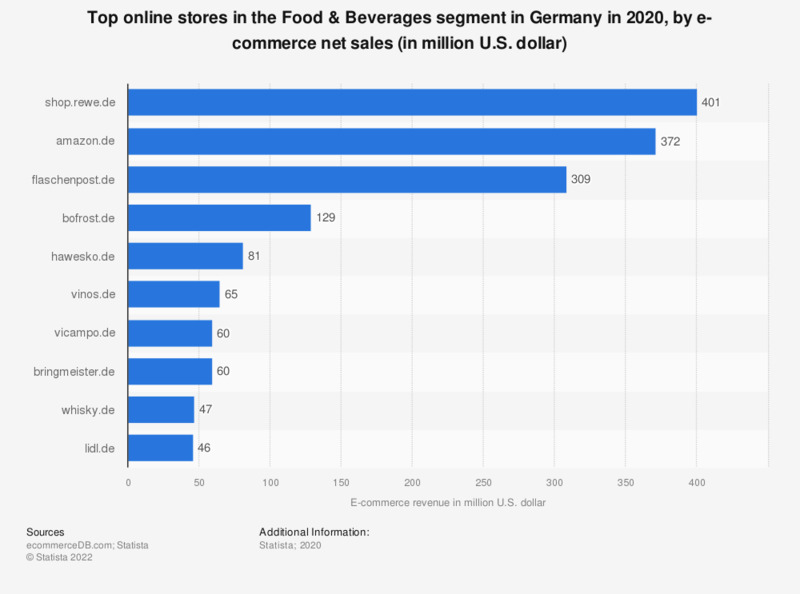 This statistic presents a ranking of the most popular online stores in Germany in the food and beverages segment in 2018, sorted by annual net e-commerce sales. In 2018, market leader hellofresh.de generated 568,6 million U.S. dollars via the sale of food and beverages in Germany. The online store amazon.de was ranked second with a revenue of 239,5 million U.S. dollars. The e-commerce market category “Food & Beverages” contains the online sale of fresh and packaged foods (excluding baby food), delicacies and beverages. This market category covers for example the sale of fruit, vegetables, pasta, snacks, sweets, refrigerated products, frozen food, soft drinks and alcoholic drinks via a digital channel. Not included in this market category are delivery services of ready-to-eat meals.